Worlds collide, laced with layers of corruption, as deception permeates places, events, and relationships across generations in the first book of this adventure series. 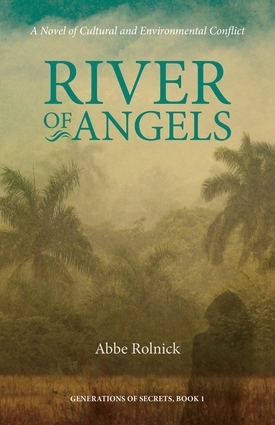 River of Angels, set on a tropical island in the Caribbean, reveals the multiple facets of life condensed within a small town. The story examines individuals caught between the world of conventional society and the world that speaks to an individual's true self. Through the lives of a prostitute, a healer, an entrepreneur, a beggar, and two elders, the reader reflects on the intricacies of human nature. Rolnick spins an intriguing tale of intertwined relationships and clashing elements of culture on the island of Puerto Rico, where the characters strive, sometimes struggling within themselves, to make a life. Monica, a prostitute by choice, controls every aspect of her life, until her world crumbles. Rosie, a professor and healer, forsakes the comfortable role of teacher and wife to unravel the mystery of her father's past and discover a cure for her own malady. Carlos, a successful entrepreneur, witnesses his certainty dissolve and his beliefs questioned. Pide, the beggar, brings wisdom, humor, and friendship to those he watches. Abuelita and Don Tuto, the elders, lead others to safety as they resolve history's hold on their lives. Contemporary issues of social justice, environmental destruction, crime, and avarice act as a backdrop for the inner story of relationships. The characters take you into two worlds, the surface world society accepts and the underground world of caves where the unacceptable thrive. The story blends two worlds and the hope of possibilities that keeps these characters forever in the reader's heart.